Above all, field service organisations need to be able to match the resources at hand to the organisation’s service demands. This means managing schedules, timeframes, and workloads, so that resources are utilised optimally. Dynamics 365 for Field Service offers resource scheduling optimisation (RSO) to make sure resources are allocated in the most effective way possible. 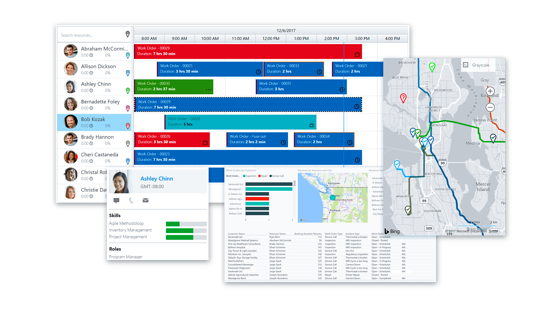 This automated scheduling tool takes into account the skills, locations, durations, travel time, and priorities of your team and helps you schedule these so that you meet your objectives in the most efficient way. Not only does this help you fit in more appointments, you can also improve efficiency and customer satisfaction. The ultimate goal is to have technicians able to assist customers on time, the first time with the right skills needed to get the job done. This is how you can deliver the most value to your customers. What’s more, drag-and-drop functionality makes it easy to manage resources and schedules in real time. Your technicians need to be able to access information and easily communicate with colleagues and customers to do the best job that they can. From accessing customer information to overcoming unexpected obstacles to crowdsourcing expert knowledge from colleagues, quick and easy communication can make the difference between a satisfied customer and a dissatisfied one. With Dynamics 365, your technicians have access to everything they need to get the job done, including contacts, customer references, bookings, customer assets, maps, work orders, and much more. Even better, their colleagues are just a few clicks away. Technicians become much more effective this way. The potential of the internet of things is vast. When it comes to field services, intelligent machinery and equipment can connect and communicate with technicians and the head office via Dynamics 365 for Field Service. IoT can play a vital role for organisations that want to upgrade their costly break-fix service model and replace it with a proactive 24/7 service. With IoT-powered machinery, the equipment you use can monitor its condition and issue an alert as soon as it notices a fault. It can even report issues before they become real problems, helping businesses avoid downtime from faulty or broken equipment. This saves time for technicians, who no longer have to make as many trips to sites, which in turn saves money both for yourself (as technicians can work on something else instead) and for your customers (who can carry on with fully functioning equipment, avoiding downtime). 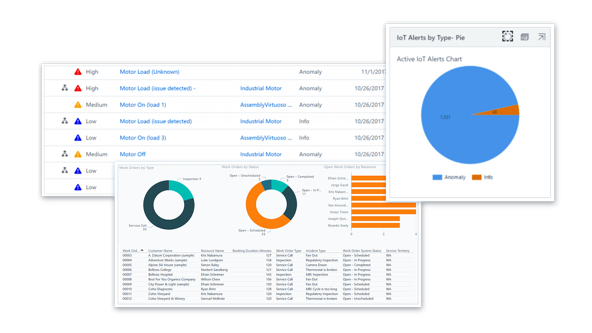 Dynamics 365 can easily customise IoT alert workflows that dictate how issues are escalated at your organisation, so that you have full control over your IoT deployment. Dynamics 365 offers field service technicians unrivalled capabilities in the field. Not only can they connect to all the information stored in the system (e.g. work orders, customer info, and more) using mobile apps, but they can leverage emerging technology such as augmented reality via the HoloLens headset. At Lanrex, we connect businesses with the technology they need to get ahead — and stay ahead. Our experts are focused on finding the right solutions to meet your unique business goals and requirements, so that technology becomes a business advantage. To make the most of Dynamics 365 for Field Service, you need a partner you can trust to help you deploy the system, up-skill your staff, and offer continued support. We offer a 4-stage business diagnostic so that we can get to know your business values, long-term goals, and how your employees like to work, so that we can optimise technology solutions for you. To find out more about Dynamics 365 for Field Service or to learn how Lanrex can help your organisation operate at the very top of your field, contact us today.